I saw this on Camille's blog...so I tried it. Only one pic won't show as the person opted out of being a part of big huge labs....it was suppose to be cupcakes. My mother in-law is so helpful with my girls...well my father in-law too...but he gets bored easily LOL. My MIL is a quilter too. I have showed some of her quilts on my blog. This trip she and I started some wallhangings...identical nearly. I cut all the fabric and traced the applique shapes and cut them out for us. Just so she could sit and piece while DD2 slept. She assembled most of it over the weekend! She also started 2 more projects with one of my jelly rolls and some other scraps. I didn't add much to my stash over the Vegas trip and I busted about a yard this weekend...now don't get me wrong I am FAR from a stash buster....but I am keeping track of what I added vs. used. I am WAY in the hole of buying. I hope to have some pics of what I've been working on coming this weekend. I bought a pattern for crocheting on the edge of blankets. It explains briefly that you should have the edges Hem Stitched. I have researched this and I am hoping some of you can help me find a place to get this done OR let me know IF your janome or Viking can do this type of stitch, I'd trully appreciate it. So it's 9:30 and IF I want ANY pictures to post here..I need to get back to my projects. It's friday and we're in Vegas having fun! The time zone thing really messes me up...therefore I am up. I'm ready for some serious Vegas breakfast. We're staying at NY NY and love this hotel. Here's the view from my rental car......ah rain??? in Las Vegas? I thought we were in the desert! After a little breakfast I headed to the quilt shops. I had a course mapped out to get to today...and joann's and the mall in Henderson. 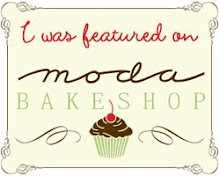 I also had a big list of items I am looking for......mostly what I've seen on the fat quarter shop in the last 2 days! I also found these cute cupcake fabrics and M.E. charm pack to use for my Chubby Chicks pattern. So the Christmas Goose was the best of the 3 shops. I found nothing at the Fabric Boutique :( and Quiltique I found some Shiki fabric by Kumiko Sudo....but I don't have a picture. We are heading home sunday...and to be honest I can't wait to get home and see my girls. I spent my weekend at continuing education course. It was phenomenal! I was inspired and learned so much. 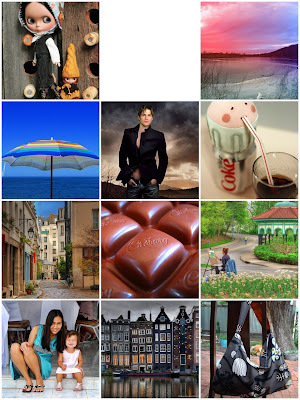 Yet somehow I am not feeling blog motivated. I think about my blog and then I think "ehn...not doing that tonight...I'll head to bed instead". It's not that I'm not inspired...because I am...I have been working on projects, but nothing is to a point I want to show it. Ok I'll show some of it...... Fresh Cut by Heather Bailey...and it's 'fresh cut' LOL....I took ALL 40 FQ's and cut em up...I think I will get 2 quilts out of it.....just wait and see. I need another quilt away weekend!!!!!!! Perhaps I will do that one of these days with my close friends down south? In the mean time...my husband and I are heading to Vegas. You know what? all I want to do is rest and sleep...but then...I won't sleep..I'm not sleeping now and I could be. I think it is just mental exhaustion. Where will I put my 110% today? children, husband, hobby, work?? where...I want to give so much of myself to all of them. It seems if we are great in one thing, another suffers. I could go on and on but I have to get to bed! Oh and one other thing, I have been asked about the Jelly Quilts book....um All I can say it "Buy it"...I don't think you'll be disappointed. They have some seriously clever ways to make those quilts...and there is a quilt holder bag pattern in the book...um ingenious idea. Sometimes things don't turn out how you think they will. A fine example is that I have tried to post this for 3 days. Right now the baby is fighting sleep...she needs to go to sleep....and I am just not getting anything accomplished. I am waiting the 5 minutes before I go back in her room..but 5 minutes is an eternity it seems when they cry. I have gotten emails that I haven't updated here...things have just been busy....sort of. Today I stopped at the local quilt shop and chatted with the owner. I'll say more about that in a minute. Then DD1 and I went to the Green Valley nursery....um can you say insane? well I was for trying on a saturday. I waited 2o minutes to park...spent an hour looking around and then 20 minutes to check out. We did find some great plants so it was worth it. Ok DD2 stopped crying at the 4 minute mark...thank goodness. Anyhow, back to my chat, well it all started on thursday. A friend and I went up "north" to a few quilt shops. No pics? well let me tell you our trip was quite a dull adventure. My friend spent 18 cents at the first 2 stops! The 2nd stop was this most sought after quilt shop. We'd heard it was fantastic. We walked in, were NOT greeted...first negetive. Then I thought it would be great to snap some wide shots for my blog to give them free advertising. Now I am not posting this to start a discussion. I am simply stating what happened. I snapped one pic and was barked at that there will be "no pictures in this shop". I said I was sorry ( I should have asked) that I was going to post them to my blog to give them some plug and she snapped at me again. I was pretty bummed. 2nd negetive. I think it could have been handled more gently....perhaps "I'd appreciate it if you didn't take photos....perhaps I could get one of you and your friend instead". I certainly have pipe dreams. I refuse to say what shop this was...I will give her NO press... and I will never return to her shop. 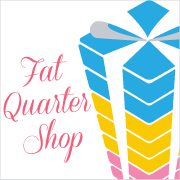 I feel that IF I can't find what I want at my local quilt shop then I will get it online....like the fat quarter shop. I will not spend hard earned money when I am treated like dirt. So now I am done with my rant. We stopped at 2 more shops and found nothing of any consequence except a post card of the Amish Shop Hop quilts 2006...the only one I didn't have. Geez it was a bummer day. I do have some cool projects going. I hope to show them soon. Saturday was better....as in the mail my amazon.com pre-order came! woohoo...now I have some reading material tonight. I made this table topper and thought it looked real simple...come on, 20 5 inch charms for the center and 18 half circles for the border...how hard could this be? well I'll tell you...those circles...took forever AND when I finally layered it and sewed and turned it out, I had a mess. The corners were/are terrible....I took it apart 5 times! and it didn't look any better. SO I decided to cover up the mistakes with buttons!! This is a sneak peak at my latest project....what's with my photography skills today? guess I was in a hurry...anyhow blurry cherry baby scraps...will be turned into a lovely lil' quilt soon. Oh Oh Oh looky what I got today...the local quilt shop was participating in a shop hop and I thought I'd stop and see if she had the new Quilt Sampler and sure enough she did....I'm on a lucky streak??? maybe.....And the quilt below was designed by the shop owner...I have 4 blocks made and all the triangle pairs sewn. 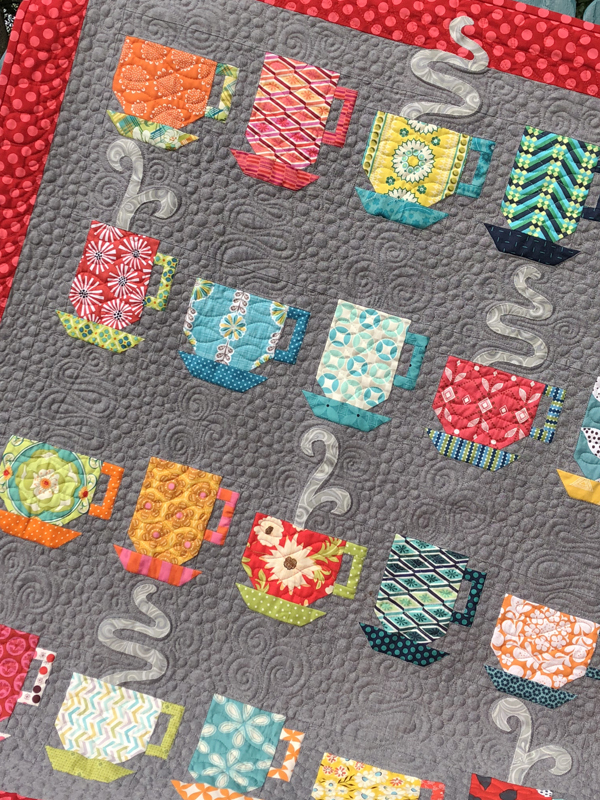 mmm I love this quilt aqua and a mix of colors for spice/interest. I wish I could put together fabrics like her. I went to JoAnn's armed with 3 coupons...and got these. 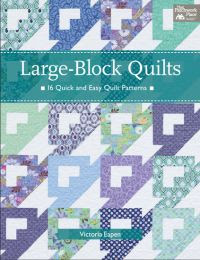 I have needed some inspiration for my machine quilting and so I am going to try these follow the line patterns. Some embellishments I picked up at Hobby Lobby today....flower rick rack...so cute.